Hi everyone! I've been spending most of my time working on Paula Deen's Real Women of Philadelphia contest. I am dying to be a finalist, fly to Savannah for the cookoff, and meet my hero, Paula herself! Wish me luck & you can join in on the fun, too! Go here for details. You will need 3 pancakes for each rabbit hole stack. Yum! To assemble, spread 1/2 T.peanut butter and 1/2 T. jelly on top of one pancake. Place second pancake on top. Spread 1/2 T. peanut butter adn 1/2 T. jelly on second pancake and top with third pancake. We used Peanut Butter & Jelly because my kids requested it, but you could use anything! Jam, flavored cream cheese, you name it! Mix whipped topping with a few drops green food coloring. Divide topping in 3 parts and spread over pancake stacks. Drop 1 T. mini chocolate chips on top of each pancake stack to form a "rabbit hole"
Snip each marshmallow into 3 pieces. Dip one side into colored sugar (optional). Insert toothpick into each marshmallow and insert two of them into pancake stack to make your "bunny ears". Print and cut out Bunny Crossing Signs. Tape to toothpicks and insert into pancake stacks. Serve immediately. I saw the adorable chocolate covered Easter Peep Pops on Make and Takes and wanted to make our own version! We used white chocolate on top, edible eyes, and sprinkle noses. The girls made these all by themselves and did such a great job! Easy, cheap, and a fun class treat! Grab a group of your friends and get ready for some fun! This is the H family, some of our bestest buddies. See how Miss H came prepared with her apron? She's going to be a great chef! Melt the chocolate and let the kids dip one side of the peep in it. Lay on wax paper. Add edible eyes, a nose (or whatever else they want). Dip a sucker stick in a generous amount of chocolate and push into bottom of peep to make the "tail" and adhere the sucker to the stick. Let sit to harden. If you can catch them before they're gobbled up, you can wrap in sucker bags and tie with ribbon. Happy Easter! I put out lots of extra sprinkles, mini marshmallows, and other fun goodies for the kids to use...we had some cute and silly bunnies! We're having a Cherry Raisinets Giveaway Extravaganza! Go here to enter! 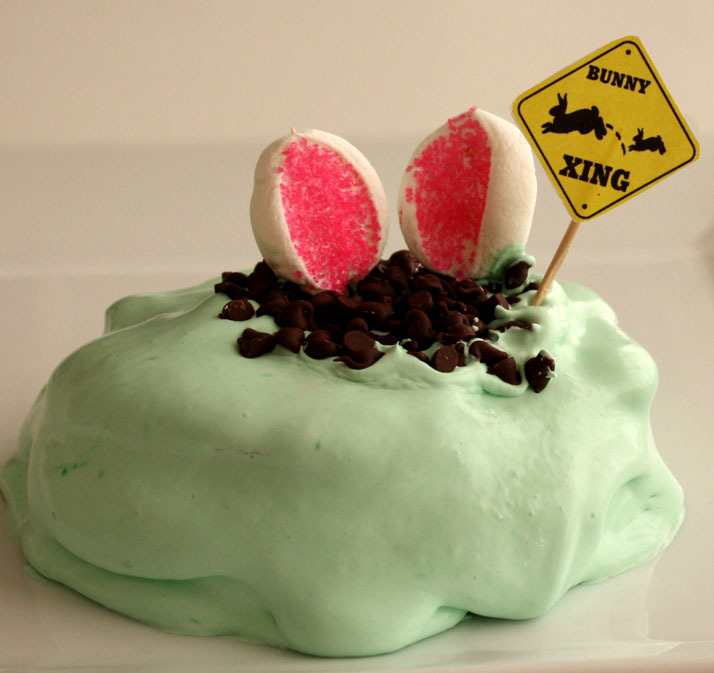 Now, are you ready for the cutest and the cheapest Easter treat ever??! and have a sweet-filled Spring!" 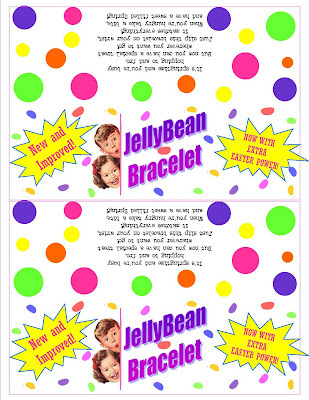 Using a 12 inch piece of dental floss and clean sewing needle, thread on 15 or 16 regular sized jellybeans (this is a good size for a kids' bracelet. You can adjust for adults). Tie ends in a square knot, leaving a little bit extra room for the bow, if desired. Trim ends. 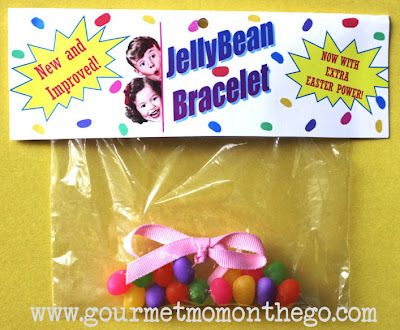 Tie a bow with your favorite ribbon (optional) Place bracelet in sandwich baggie. Fold label in half and secure to sandwich baggie with double sided tape or staples. Enjoy! For a little extra finish, you can punch a hole in the top to make it look more like a "real candy bag" (Big C's advice. Thank you, Big C!). Big C ready to share her fun new treat! Enjoy! at our house. It's fun and a great way to have a mealtime conversation! 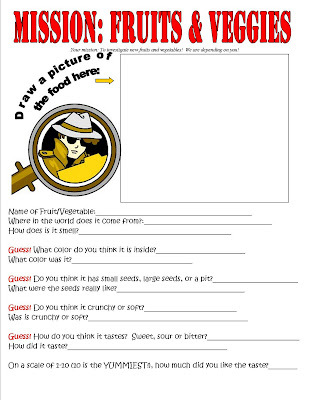 You can download the Secret Mission Worksheet I made or just discuss the questions around the table. Enjoy! For toddlers (we have a 3 year-old): ask them the questions and give them a chance to answer. They can also draw a picture of the fruit on the page or any blank paper. You could also have some kind of "secret agent hat" and magnifying glass that they can use during their adventure. Need a quick and fun idea for St. Patricks Day lunch today? The gourmet girls LOVE hard boiled eggs. So, I whipped up a batch this morning and am serving them for lunch with a plate of green crayons. Let the kiddos draw all over their eggs--it seems "taboo" to draw on your food, so they'll love it! Then, they can peel them and eat away. Serve them up with baby cucumbers, green grapes, green milk, green pears, and of course lots of kisses! For dinner, we're adding green food coloring to the water while we cook rice and some chicken. Easy! I'm also letting the girls use Grands biscuit dough to shape and bake shamrocks. What are you having (or did you have) for lunch or dinner today? I'd love to hear from you! I wanted something different and fun for the girls to give out on St. Patty's day. 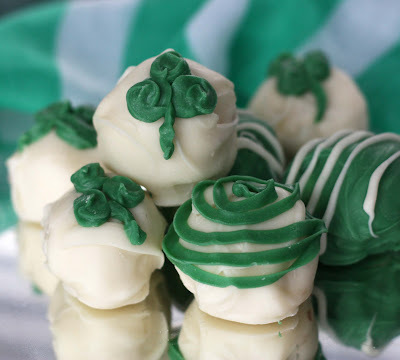 I had heard of Irish potato candy before and thought that could be fun and festive. After doing a little reseach, I learned that Irish Potato Candy is actually a traditional Philadelphia confectionery, is not Irish, and does not actually contain potatoes. Rats! Oh well, we made up our own version using Sweet Potatoes (I couldn't resist one more recipe for the Sassy Sweets Cookoff) and the results were SO GOOD. You can't taste the potato, it tastes like a sweet almond treat, almost like smooth & creamy marzipan. Cook sweet potato (oven, microwave, whatever works for you) and let cool. Peel and place into a large mixing bowl with condensed milk, cream cheese, butter and almond extract. Mix well. 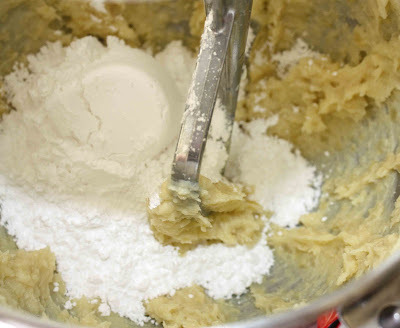 Add powdered sugar one cup at a time, until mixture is thick enough to roll into balls that will hold their shape. Add sliced almonds and mix until combined. (Note: depending on your climate, you may not need this much powdered sugar or may need a little more). 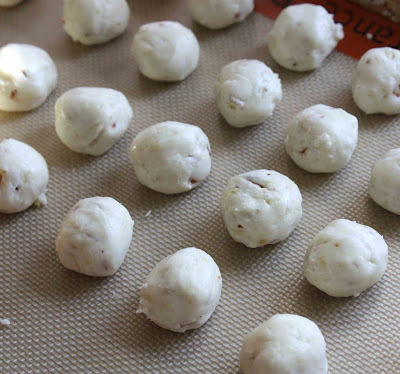 Roll into 3/4 inch balls and set on wax paper or baking sheets. 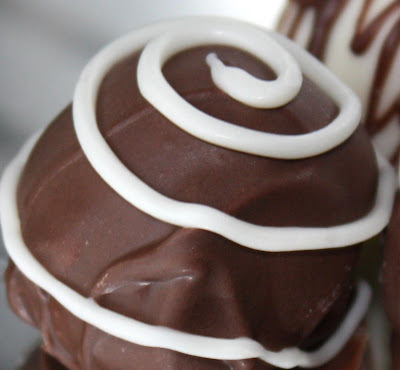 Melt chocolate on a double boiler or in the mircowave at 30 second intervals, stirring after each interval. Dip potato candy in one color chocolate and garnish with the other color (I like to put some in a quart ziploc freezer bag, snip an end off and "draw" with it). Let set completely, about 5 minutes. You can store these in the refrigerator for up to a week. Enjoy! We've had a fun family week of vacation! 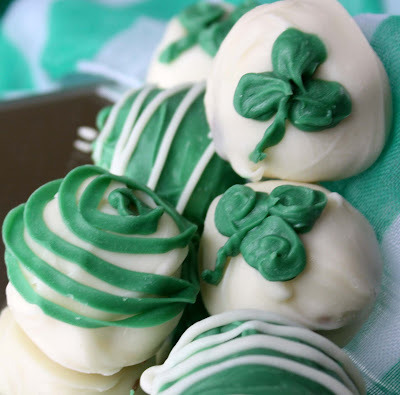 We'll have a fun St. Patrick's Day treat idea up in the next couple days. Here are a few of the recent Birthday Cakes for Foster Kids we've done. I've had lots of emails from you asking how you could get involved in your own communities, that's wonderful! I'll put the information at the end of this post for those of you who are interested. 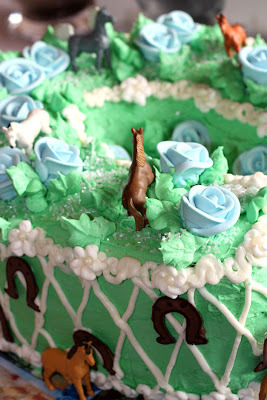 Little H LOVED putting the horses on the cake! When I asked Little C what she thought of the cake, she looked at it for a long time then said slowly and diplomatically, "I really really like it buuuuut......um, why did you make it shaped like a potty seat??". I realized that she didn't know what a horseshoe was. lol! 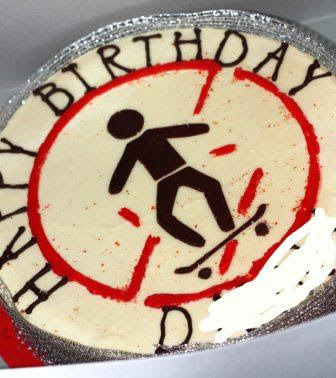 My friend Shalece made this one--A "Strawbery and Steel" birthday cheesecake for a skateboard and cheesecake lovin' teen. So, here's the rundown on our birthday cakes for foster kids experience and the system we've found that works...sorry, this is a lot of information, but I thought I'd share the things I've learned for those of you interested. Making cakes for foster kids was new territory for us AND the foster care center, so we’ve been learning as we’ve gone along. If you're interested, try the Yellow Pages to look for foster care agencies in your area. I’d suggest calling them, telling them that you know of someone who has been doing this project and see if it’s something they are interested in. Obviously you can’t make cakes for all the kids, but let them know how many you can do (maybe it’s only 1 per month) and have them pick the kids most in need. Originally, Olive Crest got together and chose 3 children per month to get cakes (that’s how many I said I could do). 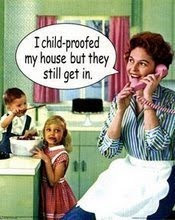 They would give me the foster parent’s contact information and have me call and coordinate it. That did NOT work well for me. It was hard to communicate with them, arrange cake drop-off, etc—it was taking me longer to do that than to make the cake and was really frustrating. 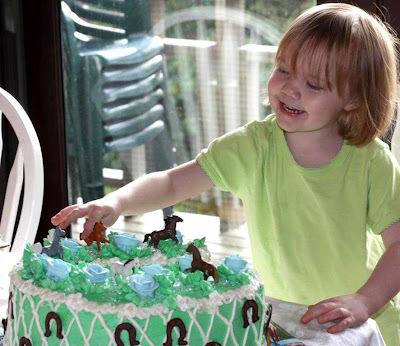 You have probably heard that we have a volunteer who wishes to make birthday cakes for our foster kids. You can see examples at www.gourmetmomonthego.com. Your children have March birthdays coming up!!! If you’d like to have a cake made for your foster child, please complete the following questions and return it to me ASAP. She likes to have this 1 month before the birthday. If you do not wish to participate, just let me know. My fabulous friend Suzette has turned many a get-together into a PAAAAAARTY with her famous cheesecake. I finally got her recipe and tried it for ourselves. The results were amazing! 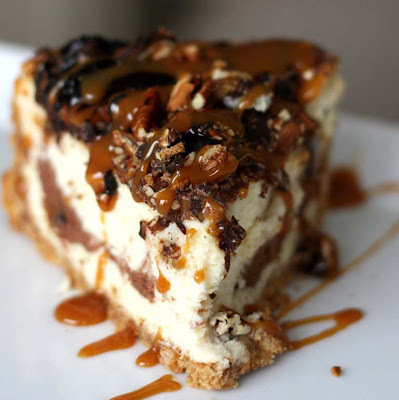 This is a great one to whip up when you need an impressive, decadent dessert! • Beat Cream cheese and condensed milk together until creamy. • Add remaining filling ingredients until well combined. • Remove 1 cup of filling and set aside. Melt chocolate chips about 1 minute, (just until melted) and mix completely into the 1-cup reserved filling. • Pour 1/2 of the white filling into crust, then the chocolate filling, then the last 1/2 of the white. Take knife and gently swirl colors. 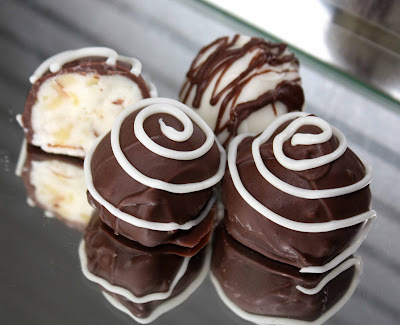 • Top outer edge and center with 1/4 cup mini choco. Chips & 1/4 cup Pecans (chopped). 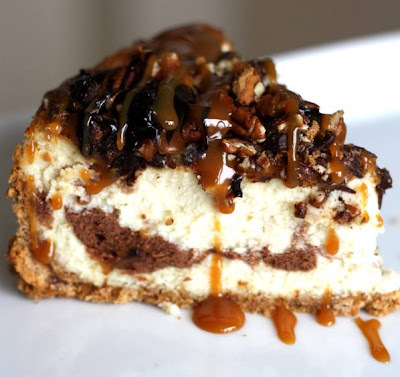 Drizzle melted chocolate chips and caramel topping all over top and drip down sides. 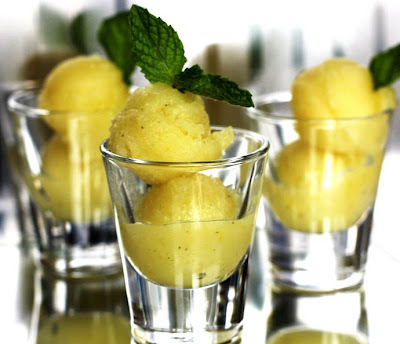 This sorbet is so easy to make! 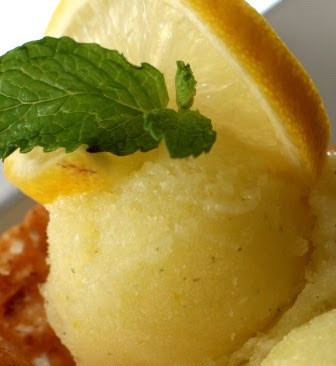 The citrus in the lemon cuts the starch in the potatoes and makes a smooth, delicious treat. If you want to be fancy, you can serve it in Pecan Cookie Cups... Or, shot glasses for a simple dessert or palate cleanser between courses. It's also a great way to use leftover cooked sweet potatoes! This make-ahead dish will keep in the freezer for several weeks. Preheat oven to 375 degrees. Wash sweet potatoes and pierce several times with a fork. Bake sweet potatoes for 55 minutes until tender. Remove from oven, let cool, and peel. If you are using leftover sweet potatoes, ignore this step. Place water and sugar in a medium pot. Stir well. Cook over medium-high heat until mixture comes to a full boil, stirring occasionally. Remove from heat and let cool, at least 10 minutes. 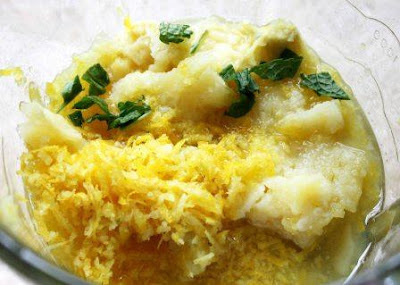 Place cooled sweet potatoes, sugar mixture, lemon juice, lemon zest, and 10 chopped mint leaves in blender. Process until smooth, about 90 seconds. Pour into pan and freeze until firm, about 2-3 hours. Remove from freezer and process again in blender. Return to freezer. 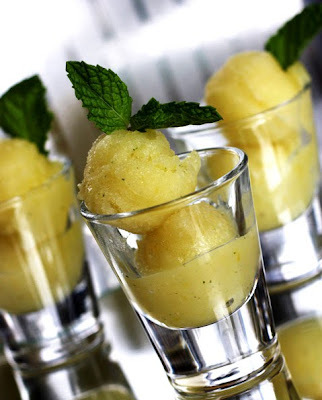 When you are ready to serve, use a melon baller to make small scoops and place in shot glasses or almond cookie cups. Garnish with fresh mint leaves. 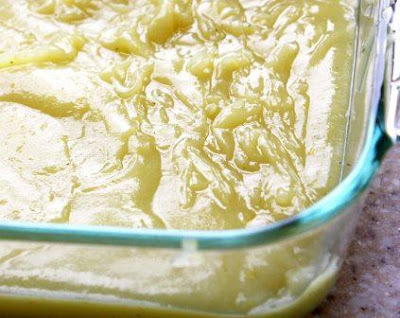 You can also keep this covered in the freezer for several weeks--great for a make-ahead dessert! Preheat oven to 350 degrees F. Place pecans in ziploc baggie and crush with rolling pin. Cook brown sugar, butter, and corn syrup in a small saucepan over medium heat, stirring occasionally, until smooth and just starting to bubble. Stir in flour and pecans and cook an additional 30 seconds, stirring constantly. Remove from heat. Drop by heaping tablespoon onto a well-greased (or lined with Silpat) baking sheet. They spread out quite a bit, so I baked four cookies per sheet. Bake at 350 for 6-7 minutes until bubbly all over and starting to turn brown. Remove from oven and let cool 3-4 minutes, until barely firm and cool enough to handle. While cookies are cooling, generously grease the underside of a cupcake or muffin tin. Place cookies onto muffin tin and mold into cup shapes. Let cool completely. Keep in airtight container until ready to serve, up to 1 week. 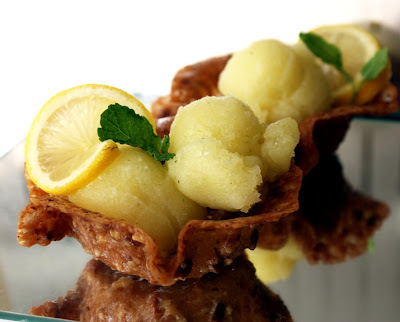 Serve with Sweet Potato Sunshine Sorbet or your favorite "scoopable dessert". Easy and fancy! I made this recipe for the Sassy Sweets Blogger Recipe Challenge, you can join in the fun and enter your own recipe, too! I have one word for this pizza...AMAZING! Packed with Vitamin A and C, this dish takes less than 10 minutes of prep. It's perfect for a quick weeknight meal and even "gourmet" enough for a dinner party. You must try this--I know it sounds unusual but it's the perfect pizza--a little sweet, a little salty, creamy and crunchy. Heaven! When I first mentioned my idea everyone said, "huh??". After trying it, there were rave reviews all around. Skeptical Gourmet Dad loved it! My super-cute friend Katie stopped by while I was whipping it up and tried a piece. She exclaimed, "I am going to go buy the stuff to make this TONIGHT!". She served it to her husband who also raved about it. Note: For those of you who aren't familiar with mascarpone, it's a delicious soft italian cheese that you can usually find in the fine cheese section of your grocery's deli. The mascarpone really makes this fabulous but if you can't locate any, you can substitute 5 oz. cream cheese mixed with 2 T. sour cream. Preheat oven to 425 degrees. Peel sweet potatoes and cut into very thin slices. Lightly drizzle olive oil over pizza crust then spread with mascarpone cheese. Sprinkle with garlic salt. Layer potatoes over the mascarpone and sprinkle with rosemary, thyme, and kosher salt. Drizzle olive oil over entire pizza (about 1 T). Bake at 425 degrees for 18-25 minutes, until potatoes are soft and crust is crispy. Remove from oven and drizzle with balsamic vinegar. Serve immediately. I made this recipe for the Sassy Sweets Blogger Recipe Challenge, you can join in the fun and enter your own recipe, too!